Joker, Harley, and their henchman are hiding out. 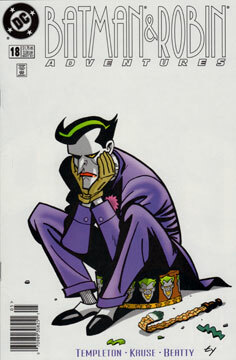 Joker is in a funk, and Harley tries to cheer him up, to no avail. Not even the flaming bucket of napalm works. Joker’s upset because of the billboards all around town that feature the faces of Batman and Robin. So she drags the Clown prince of Crime out on a spree of vandalism and destruction. When the Dynamic Duo catches up to them, Robin takes on the hired help while Batman chases Joker and Harley escaping in a van. In short order, the van is crashed, and Batman is knocked unconscious. Harley ties him to a wrecking ball at a construction site, ready to drop Batman into a wet cement “pie.” When Joker tells her it’s only funny if he does it, she runs off in tears. He attempts to follow through, but Harley’s taken the keys. In the time it takes for her to return, Robin frees Batman, and together Batman and Robin take down the crooks. In the end, Batman finds a fake parking ticket on the Batmobile, and that makes Joker laugh. Oy… When I started to chronicle each issue for this archive, I knew I’d have to sludge through some stinkers. This is a perfect example. The story takes an important element from “Mad Love” and stretches it across 22 pages. Not Templeton’s’ finest moment. The writing may not be up to snuff, but the art is worse. I know I’ve seen Kruse do better. Maybe it was in the inking? I don’t know. The characters are off-model and inconsistent from panel to panel. Templeton’s cover is great, though. No, but this is such a stinker I wouldn’t want it in continuity!